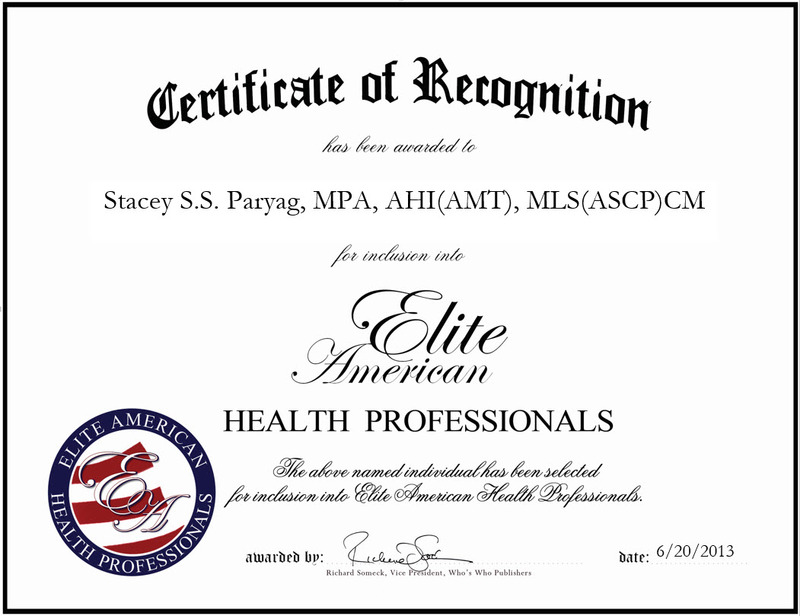 Stacey S.S. Paryag, MPA, AHI(AMT), MLS(ASCP)CM is the Program Director and Phlebotomy Supervisor at the Comanche County Memorial Hospital School of Medical Technology. With a sophisticated background in medical technology and education, Ms. Paryag makes the most of her expertise by educating medical technology students on bench technology procedures, overseeing the program, and managing and maintaining the school. She is also in charge of assisting with testing and instrumentation in chemistry, hematology, serology, microbiology, urine analysis, blood banking, and transfusion medicine. Ms. Paryag was inspired to pursue her current career path by a desire to fruitfully and successfully break into the healthcare industry, as she had maintained a long-standing interest in the field, and long been motivated to help others. This entry was posted in Phlebotomy and tagged blood banking, instrumentation, medical education, medical technology, testing, transfusion medicine. Bookmark the permalink.